By Stephen Pate – Bob Dylan appeared on Saturday Night Live only once, in 1979, to promote “Slow Train Coming”. I found the 3 videos of that rare SNL performances. I expect them to disappear so check them out if you’re interested in these powerful and historic Dylan appearances. Every time the videos are posted, they get taken down. The audio has been available for some time on the CD Bob Dylan The Legendary Broadcasts 1969-1984. For many Dylan fans, Slow Train Coming and the Christian songs on it were a repudiation of the hipster image Dylan had cultivated since he arrived in New York City in 1961. It was the same Bob Dylan voice and look but the words were the fervent confessions and exhortations of a recent convert to new-age Christianity. The November 7th release of Bob Dylan’s Trouble No More: The Bootleg Series Vol. 13 has renewed the interest discussion of Bob Dylan’s Gospel period. “Trouble No More” will release, for the first time, live performances and video of Bob Dylan performing songs from Slow Train Coming, Saved and Shot of Love. Eric Idle of Monty Python fame was the guest host on October 20, 1979 when Bob Dylan made his one and only appearance of Saturday Night Live. Dylan, dressed casually in chinos and a light blue jean jacket, played rhythm guitar on a black Fender Stratocaster reminiscent of his 1965 Newport Folk Festival performance. In 1965 Dylan eschewed his acoustic guitar for a black Stratocaster as he broke into a blistering rock performance. See Electric Dylan Controversy. Dylan led his SNL set with “Gotta Serve Somebody”, also the first cut from “Slow Train Coming.” The song would go on to win Dylan his first Grammy Award for Best Male Rock Vocal Performance 1980. Is Bob Dylan A Genuine Gospel Songwriter ? Drummer Jim Keltner and bassist Tim Drummond lay down a solid beat for “Gotta Serve Somebody.” Tim Drummond adds to the stage choreography with his signature dance to the beat. 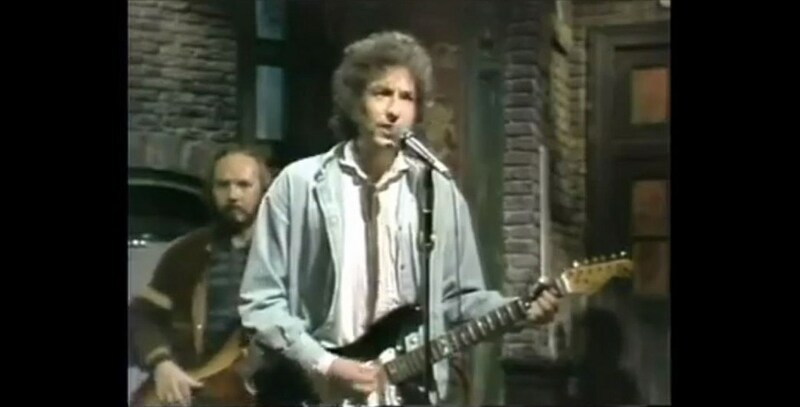 The SNL backing is essentially the band that would go with Dylan on his ’79/’80Gospel Tour. The backup singers are Regina Havis (McCrary), Helena Springs, and Mona Lisa Young. The male singer is not identified. Next, Dylan dropped the electric guitar and played an acoustic guitar “I Believe in You”. Dylan’s emotional singing is one of his best. Click on the link to see the video. Spooner Oldham switched to the Hammond B3 organ for “I Believe in You”, without the backup singers. Fred Tackett played sweet lead guitar on that song. Finally, the SNL set closes with a funky and rocking performance of “When You Gonna Wake Up”. The band ups the tempo and intensity as Dylan issues his warning to wake up to the message of Christ. This was not the usual message for an SNL audience. Click on the link to see the video. 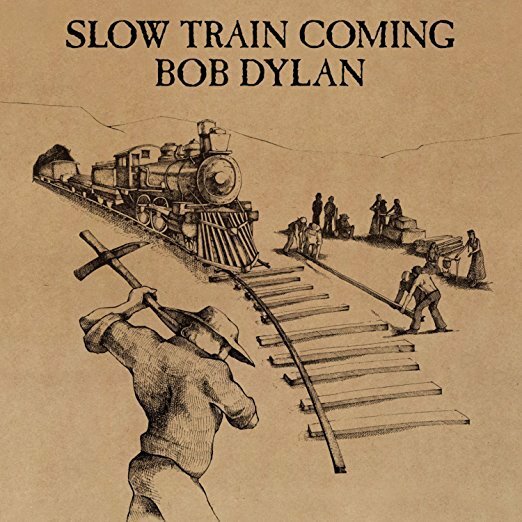 Bob Dylan recorded Slow Train Coming over two weeks between April 30 – May 11, 1979 in Muscle Shoals, Alabama. Columbia Records released the album on August 20, 1979. Time has tempered most opinions of Slow Train Coming. It has become accepted as one of Dylan’s great works, even by critics who panned it in 1979. Slow Train Coming is available from Amazon.com and iTunes. On November 1, Dylan began a lengthy residency at the Fox Warfield Theater in San Francisco, California. They played a total of fourteen dates, supported by a large ensemble. It was the beginning of six months of touring North America, performing his new music to believers and his heckling fans alike. All three SNL songs are available from Amazon UK on the CD Bob Dylan The Legendary Broadcasts 1969-1984 along with songs from The Johnny Cash Show, The Legend of John Hammond, 1980 Grammy Awards, and David Letterman Show 1984. Also from Amazon in Canada. For some reason, the CD is not available in the USA.